Hooray! I have yet another fun giveaway from Pillsbury Baking. The theme is “Celebrating Every Day Occasions”, one of which just happens to be the change of seasons. For a chance at receiving the sample pack, leave a tip in the comment section telling me how you celebrate every day occasions. Make sure to comment before midnight on Sunday. I will pick one comment the following Monday (May 6) and notify the commenter that day. — by grilling dinner (or letting Todd grill dinner) and serving it with a bottle of wine and a fun dessert. — planting a new herb or flower. I’ve always been a terrible gardener, but I keep at it anyway and have found that with practice and trying new and different plants, I’ve actually managed to grow a few things. — baking something seasonal. 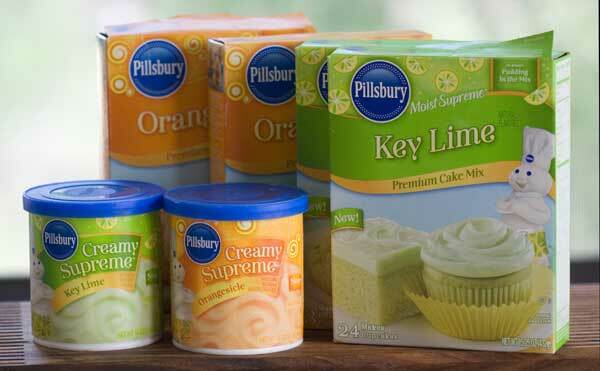 Obviously, Pillsbury made that easy by sending samples of Key Lime and Orange Creamsicle cake mix. 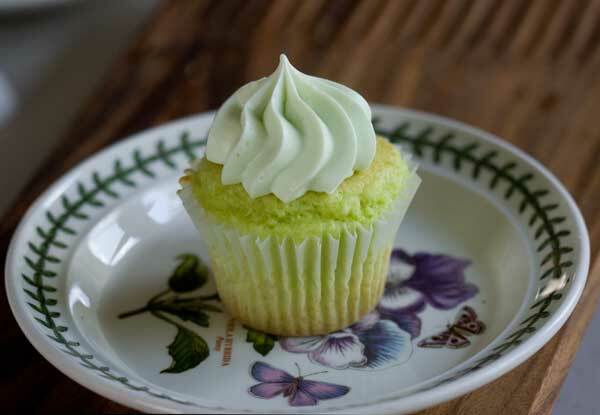 Inspired by all the green in my yard and my success with the front garden, I decided to take advantage of the new lime cake mix and make a cupcake version of the Creamy Lemon Lime Cake recipe on the back of the cake mix box. Todd loved them. I thought they were pretty good too. But I have to admit, I liked the flavor of the orange cookie mix even better. 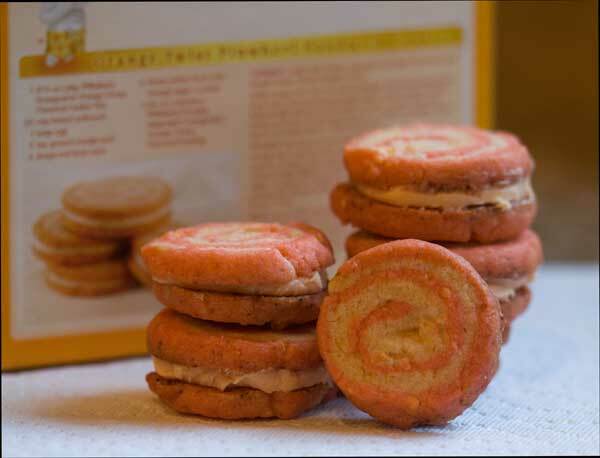 Plus Pillsbury had a few interesting recipes that called for it, including these Orange Twist Pinwheel Sandwich Cookies. These were Fuzz’s favorite. Now it’s your turn to try the new items. Good luck with the giveaway, and if you have a chance, stop by the Pillsbury Baking Facebook Page to check out all the special promotions including the Create Your Own Celebration Calendar which is pretty cute. Disclosure: This post was sponsored by Pillsbury, but I sampled the treats and the opinions expressed are my own. We celebrate special family achievements by using a “celebrate” plate and serving the person’s favorite dinner! We celebrate with family dinners. Those home always eat together at the table. I always try to find some food item that represents whatever holiday or event is taking place. Pinterest is a good place to start! special little treats and laughter! We celebrate by cooking a special meal during the week. I celebrate my keeping a vase of fresh flowers on the counter. I celebrate with a good meal and some wine. I celebrate every day occasions by getting out the ice cream and toppings! Thank you! I celebrate every day occasions by baking a cake or having a picnic with my children. I like wearing something slightly fancy. Putting on a skirt or some heels makes any occasion feel special. I’m a food person, so we celebrate with favorite meals or desserts. Pancakes for breakfast for the kids and cocktails with dinner for the adults! I like a special breakfast. Start the day off right! I love to see family & friends enjoying something I’ve baked or cooked. Often we celebrate a special day or special occasion with a dessert. However, now that we’re retired and the grown children living in other states – we’ll sometimes celebrate with an appetizer and a special ‘new-to-us’ cocktail or just the usual glass of wine. The Pillsbury products sound/look interesting…. would be fun to try! I celebrate with a special homemade dinner and dessert. Hubby takes on dinner. I take on dessert. I celebrate by cutting fresh flowers from the yard and putting them on the kitchen table. The celebration might be for something as simple as a clean kitchen! We celebrate by thanking God and praying and inviting friends to share the happiness at our home for food! Lighting a “victory candle” for an achievement. We cook a meal. We each make something so no one has too much to do. we celebrate with a favorite meal – it may not be anything special to anybody outside our family – but “dad’s mexican meatloaf” is still a treat! We celebrate everyday occasions by using the special set of dishes that are reserved for celebrations. Just dining on unique plates makes a meal feel celebratory. My husband is the day to day cook at our house and I’m the baker (which doesn’t happen every day or even every week!) so every once in a while I surprise my husband and bake one of his favorite things (including Key Lime Pie) – just because. I think we have good intentions of celebrating every day occasions but we just get busy, distracted, etc. Thanks for the reminder! Candles. Everything tastes better when eaten by candlelight, which sets the mood and makes you slow down. Plus it hides the fact that my food may taste good but looks different from the photo on the website. We have a fairly new way of celebrating everyday occassions. A year or so ago my granddaughter brought home and exceptionally good report card. After we’d all oooo’d and aaaaa’d over it she threw up her hands and said “I know what we need: celebration pie!! !” Since that day whenever we want to make the day more special–it’s time for celebration pie!! We celebrate by planting a new plant or flower, or for the bigger occasions – a tree. We will plant a small cherry tree this month to celebrate the 6th anniversary of our children’s adoption. There really is nothing like a living way to build memories! Now whenever we look around our home & yard, we remember all the wonderful times we celebrated by planting. Maybe not the most healthy, but every once in a while, just for fun, we’ll give each of the kids $1 a make a trip to the nearby gas station. They get to spend their $1 on any candy they want. It’s great fun! Baking is our favorite way to celebrate everyday occasions, A sweet treat makes life sweeter! Going out for a walk with the family on one of these warm and beautiful nights. The weather in DC has been alittle cool, but nice. I enjoy everyday with my Husband & 2 Basset Hounds. A piece of dessert everyday is a must! Like many who’ve commented, I always like to have some home-baked treats at the ready, or at the least, plenty of ingredients on hand to make cookies or brownies at a moment’s notice. And then there are the extra touches that elevate the ordinary: my own hot fudge or caramel sauce for ice cream; colored sprinkles for garnishing; dried coconut, a nice addition for so many desserts; and fresh whipped cream, just the best finishing touch! I celebrate every day by cleaning up dishes from my husband’s cooking. A fair trade! Plus sharing pieces of fruit with him. I would love to try these Pillsbury products-especially since they come from Minnesota!! I drink one can of soda every day, because I enjoy it no matter what they say about it. They say you should do everything in moderation, including moderation. They all revolve around big family get togethers with lots of food! I love to bake a new dessert! Our special occasions always include food…. a meal or maybe just a new dessert. 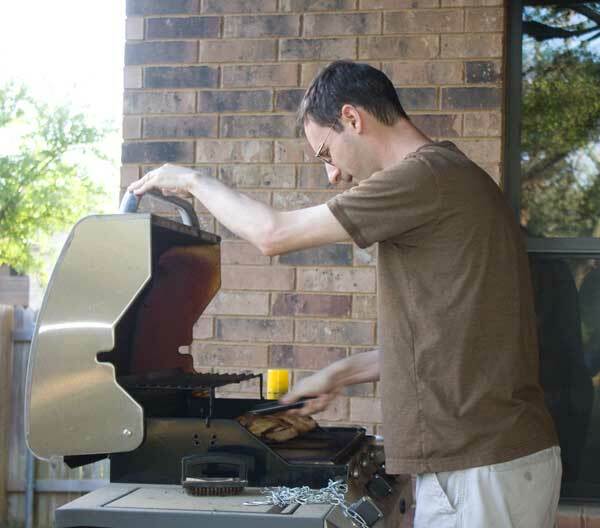 Our special occasions meal would sometimes be hamburgers on the grill with all the fixin’s to be eaten by candlelight. I love to make myself an adult milkshake – milk, ice cream and a splash of Bailey’s! I too enjoy planting in the spring. But guess what – it’s snowing in KC! My lilacs bloomed yesterday & are now weighted down, and my beautiful tulips are freezing. Sad. I use any reason to make a dessert. By making baking and cooking a family affair! It’s always more fun when everyone helps out! Definitely love having a good glass of wine! For our family celebrating big or not so big occasions ALWAYS includes dessert! Nothing like some sugar to brighten your day! I haven’t tried the cake mixes, but I have had the orange icing and it was very good. I used it on some brownies. By squeezing your loved once a little tighter when they come home and sharing the special even with a sweet treat. I like surprising people with little gifts, like something I bake, flowers, or a small luxury I know they will enjoy. My favorite way to celebrate everyday is by making cupcakes! I have a little plastic cupcake holder that I send to school with my granddaughter. She is in kindergarten and can read very well, so I give her little reminders of how much I love her taped on the cupcake holder. A different message whenever she takes one to school. My way of celebrating everyday is by baking. I love baking and the joy that it can bring to others! My way to celebrate everyday is making a yummy meal with dessert since I don’t make them very often. Thanks for the chance to enter. I celebrate everyday occasions by enjoying a hot cup of coffee with creamer! We always seem to celebrate by getting the family and extended family together for lunch or dinner! Having my husband grill the entire meal and eating it outside makes any day special. I like to have some fresh flowers in a vase near the kitchen sink. Since I love to bake, I usually celebrate everyday occasions with something freshly baked to suit the occasion. It doesn’t take that much to make a day special, make it a celebration – flowers on the table … and cake (!) are my recommendations. We celebrate with some grilling! Sitting on the deck while some awesome stuff sizzles on the grill is a great way to celebrate! I celebrate with my family by making something nice for dinner and dessert and doing something together, such as watching a movie or TV show we all enjoy. Going for a car ride together and stopping for a treat. A just because day usually means hanging out in my pajamas longer and having homemade popcorn/oranges or apples for supper and watching a movie or reading a book. If I want to bake it will be a loaf of bread like cheddar cheese or cottage cheese dill bread. I like the idea of both flavors of cake mix but the orangesicle one really catches my taste buds. I start with decorating the mantel to a theme each month, then bake stuff in that theme all month long. Since the weather is nice get together with family and friends more with bbq and pool parties! We celebrate every day occasions by joining with family and friends for a big pot luck dinner! We like to celebrate an average day, by leaving a special note in a lunch bag or on a car seat, letting the person know that today they are thought of. Have even left an anonymous note for neighbors and coworkers. It’s great to see how it brightens someone’s day. I celebrate by telling my husband “I Love You” every single day! By nature i’m always a explorer looking for a challenge. When it comes to celebrating any occasion is trying to make something that someone can’t leave the house without asking How did you make that or can I have the recipe. we used to have waffles for dinners, which i thought was pretty cool. Usually celebrations involve food in some way. Whether baking or cooking something special or ordering out. But sometimes I celebrate by buying something I’ve had my eye on for a while, like a special book. A delicious frosted cake for any day is always nice for a surprise celebration. We celebrate with our daughters and their families usually with a cake my daughter decorates. She is really good at it. Whomever gets the cake feels very special. We celebrate great weather by going out picnic in the park or by the river. I celebrate every day occasions by spending time outside on my balcony! We make homemade ice cream when we want to celebrate! It tastes incredible and the kids think it’s fun! When my 7 yr old has a great day at school, we go get ice cream and go to the skate park! He likes to talk, so a good day at school is a wonderful reason to celebrate! I like to begin celebrating the weather change by getting the grill ready for our busy spring and summer. We celebrate the warm weather by going to our local Dairy Queen. We buy our favorite treats and then sit outside on their picnic tables and people watch. We are celebrating the warm weather by eating dinner out on the deck. We celebrate the warm, gorgeous weather by grilling and eating on the deck. We celebrate everyday occaisions with a special dessert… for example, instead of ice cream in a bowl, I make sundae’s in waffle bowls, making a favourite cookie, etc. If it’s an everyday celebration, we’ll have something for dinner that everyone likes, and maybe pull cupcakes out of the freezer. P.S. I was just thinking that biscoff might go really well with orange – I bet biscoff frosting on creamsicle cupcakes would be good! I usually make a fancy dinner with steaks and potatoes and spinach. Those new cake mixes look interesting. I’ve seen them at Target but not tried them yet. By getting a bottle of wine and maybe a more expensive cut of meat. We usually get our now adult family together each of us bringing something to the celebration. I usually end up with the bread, dessert and salad. The best celebration dinners are BBQs and sitting around watching a HBO presentation. We celebrate by calling our daughter to share the event. We take advantage of the warm weather by grilling and eating on the deck. I like to make treats too and the kids share with the neighbors. I will make something sweet for dinner. I have been known to bake just some brownies or a white chocolate cheese bars for a just event. A just event is something special for that day. Now and then, we’ll have a living room picnic with the kids. We’ll spread a big blanket on the floor and all sit there in front of cartoons and eat our lunch/dinner. It’s a lot of fun!! I celebrate everyday occasions by sharing a treat with my kids…a piece of chocolate in their lunch, a cookie after dinner, extra toppings for their ice cream. Anything that will make them smile and feel just a little bit more special! I like to celebrate everyday occasions by getting outside! Before it gets too hot here in Austin it’s nice to get out in the evenings and enjoy the beautiful city!